false conclusion.” Let us consider the square           low are two oscilloscope graphs of the GB-4000. sine  wave  at the same fundamental frequency           -page report that covers all of the machines. added to an  infinite  series of odd-multiple sine-     Chapters 5 through 12 cover this information. 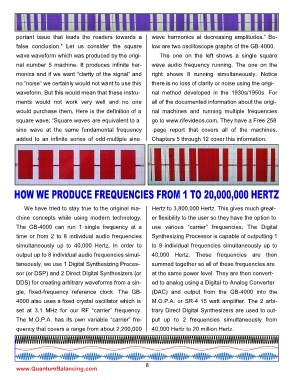 quency that covers a range from about 2,200,000         40,000 Hertz to 20 million Hertz.